If you’ve never tried decoying rutting bucks, you’re missing out. 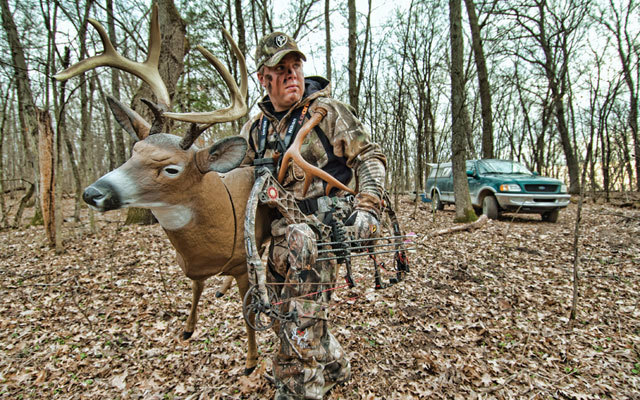 Here's our Whitetail Deer Decoying Tips for Dummies, which includes four killer setups. Two scenarios. You tell me which more closely reflects your own experience with deer decoys. Scenario #1: I’m up a tree in Kansas in mid-November and have a young buck decoy 25 yards in front of me. Cruising through on the prowl comes a big 8-pointer. I get his attention with a grunt tube. He sees the decoy from 100 yards away and immediately turns and comes to it, bristled up. He swings around to go nose-to-nose with the decoy, but before he can start the fight, he begins running out of air—courtesy of a well-placed Thunderhead. Scenario #2: I’m up a tree in Illinois in mid-November and four does come into a small food plot where they see the same decoy. Instantly the girls are on red alert, stiff-legged and so terrified by the sight of the new kid on the block they immediately turn tail and race back into the tree line. Deer decoys. Sometimes I love ’em, sometimes I hate ’em. There’s little question that, under the right conditions, a deer decoy or two can help you put the wood to mature bucks. It is also true that, sometimes, the decoy will scare the pants off a few deer—maybe even all of them. I’ve used decoys enough now to understand that when I set one out, it’s a roll of the dice. I’ve also learned that there is a right way and a wrong way to use them, just as there is a right time and a wrong time to use them. Here are some tips to help you get the most out of deer decoys this year. One quick caveat: You should understand something about your local deer herd before going whole hog on the decoy thing. It seems decoys are most effective when buck-to-doe ratios are not skewed heavily in favor of does. The more bucks, the better. There are also some areas in the country where I have tried decoying with poor results, and others where it seems to work best. For example, I seem to have had better luck with decoys when heavy rut activity is compressed into a period of no more than two to three weeks. Areas where the rut lasts for a long time — the Deep South, for example — do not seem to be the best spots for aggressive decoying. But again, you need to try it yourself to see if it works in your area, or if it simply scares off deer. I’ve tried all sorts of different decoy setups. There’s no doubt that proper decoy placement is the key to getting the deer right where you need them to be for a slam-dunk bow shot. Most of the time, when a buck approaches another buck aggressively he does so head-on. Thus, place your buck decoy angling or facing directly toward your stand 15 to 20 yards away. This will give the buck enough room to approach a bit off to one side or directly between the decoy and the stand, with his attention focused away from the hunter. Note: A buck decoy will generally only pull other bucks up close, so if I’m hunting an area with lots of does, I think twice about using a buck decoy since it might terrify the local matriarchal does, as was the case mentioned earlier. Conversely, a doe decoy can attract does and fawns as well as bucks, and during the pre- and peak-rut periods, most bucks that see a lone doe decoy or doe and fawn decoy might come in for a closer look. I prefer to place decoys in the edge of an open field or clearing that provides maximum visibility. Many times a buck will approach the decoy along the edge of the field or woods and then circle into the woods to approach the deke head-on. Try to keep the wind in your favor from the most likely route of approach and set up so a buck approaching or circling the decoy downwind will still give you a shot. In addition to a buck decoy, I’ll often use a doe and fawn decoy and set them closer to the stand right at the edge of the woods. A full-bodied buck in the open and a couple of decoys at the edge of the woods is a deadly combo. Also, try to keep your decoys positioned where an approaching deer will not be looking over the decoy directly at your ambush location. All game animals, from ducks to turkeys to deer, are more readily drawn to a decoy that exhibits some motion. I’ve used a number of things to try to impart the appearance of movement to my deer decoys, including toilet paper, strips cut from a white garbage bag, and fluffy white cloth strips hanging from the ears and tail of my full-bodied decoys. I’ve used Velcro strips on the decoys to hold fringed material. Today, of course, there are decoys with built-in motion. Some of it is conveyed simply, with parts that flap and sway in the breeze. Some decoys have electronic motors that allow the tail and neck to move on command from a hand-held control (they are not legal in all states, so check your local regulations before using one). There are even heads and tails that can be moved with a string pulled by the hunter. However you can do it, adding motion adds realism — and that translates into more effectiveness. Deer will not tolerate a decoy that smells like a human, no matter how real it looks. Always wear rubber gloves when handling your decoy. When hunting season starts, I clean up and wash all my decoys. Once I set them up, I spray them down with a liquid odor neutralizer. Some hunters like to use scent products with their decoys, while others do not. I personally like to use a small scent bomb with the appropriate scent, whether it is doe estrous with doe decoys or a territorial buck scent with a buck decoy. I believe the scents add a touch of realism, but don’t overdo it! Here it is definitely a case of less is more. Rather than put the scent directly on the decoy, I believe it better to place a small scent bomb on the ground between its rear legs. Don’t leave your decoys in position overnight. When I leave mine in the woods, I carry them a little way from the stand and stash them in a blowdown, brush pile or small depression. If it is cold enough for frost, be sure to cover the decoys with an old sheet, a burlap sack or brush. (I tried plastic tarps, but they are just too noisy.) A decoy glistening with frost in the morning will spook deer. Without a doubt, decoying is best during the pre-rut and rut. And while I am generally a believer in the silent approach to whitetail hunting, when I use decoys I do a complete 180. Now, depending on conditions, I believe in doing a lot of calling and maybe even some rattling. The whole purpose of the exercise is to draw a buck close enough to spot the decoys. When my calling gets their attention and draws them closer, I am counting on the decoys to do the rest of the heavy lifting. When it happens, don’t rush the shot! One of the advantages of using a decoy is that deer will parade around the decoy and give you plenty of time to draw and make a good shot once the buck has presents a broadside or quartering-away angle. Of course, this is easier said than done. When a big buck is all bristled up and starts strutting sideways around your decoy with his eyes bugged out and meanness on his mind, keeping your wits about you is anything but easy. Get your release attached and get ready. You’ve already used your laser rangefinder to pre-measure distances to and around the decoy, so be prepared to draw and shoot when the window of opportunity opens. However, don’t dawdle. I once had a nice buck doing the dance around my decoy until, without warning, he viciously attacked it, knocking it to the ground. When that happened he was so startled he blasted off to the woods, never to be seen again. 1) Corner Them: When hunting a field, check out the corners first. Bucks like to cut corners when searching for does. Also, even if the bucks are cruising back in the timber off the edge of the field, which they often do, a corner gives you twice the odds of a buck passing by near your decoy as does hunting a straight edge. Corners are also favorite entry and exit points for deer using the field. 2) Make Your Point: Much prime deer country consists of creek and river bottoms, with the flats on top of the ridges in agriculture and the hillsides timbered. There are usually gullies built by rain runoff that create a series of points jutting into the fields. You’ll often find deer that want to cross the field usually cross from one point to another, often using the two points that jut furthest out into the field. By doing this, the deer cut down on the amount of time they are exposed. The cool thing about points is that no matter what direction the wind is from, one point or the other will be huntable. If there are no trees suitable for a stand, deploy and brush in a ground blind. Try to set it up so you can maximize visibility. 3) Pirate’s Gold: Remember reading about how pirates marked their buried treasure on maps with a big “X?” Well, that “X” can also mark a killer deer decoying setup if it represents where two logging roads intersect. Big-woods deer use these logging roads as travel lanes, and bucks frequently scrape along the edges of these roads. The place where two logging roads cross each other can be an excellent spot for a decoy setup. I like to find scrapes and rubs along the edges that indicate a rut travel corridor. Also, remember that you need to be able to see at least a football field or two down at least two of the four roads leading from the intersection so cruising deer can see the decoy far enough away that it will not startle them. 4) Multiples: Many hunters are discovering that a gaggle of decoys can be better than just one. In fact, I think that a lone decoy during the pre-rut is more apt to spook deer than using two or more. The most I have ever used at one time? Five — a medium buck, bedded doe, standing doe and two fawns. Because of the number of decoys employed, this really is an evening-only deal and is best employed on a field edge. You must get to the stand early enough to get the decoys set up and yourself hunkered down an hour or more before you expect the first deer to arrive on the scene. And it is important to set the decoys where approaching deer can pick them up as far away as possible.